KOKOMO, Ind. — "Learning to read may be the single most valuable skill children need to become successful in life." Mike Glassburn reads to children at the Carver Community Center. See Flickr slideshow. 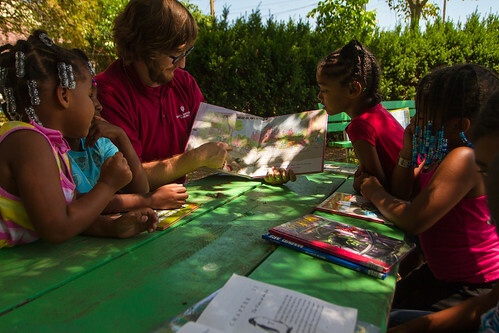 Mike Glassburn, videographer at Indiana University Kokomo, explains why he volunteered to read to children, along with about 20 other faculty and staff, at Kokomo's Carver Community Center summer camp this month. "They need us to show them that if they work hard for a personal goal, it can be achieved, and it really starts with reading," Glassburn said, adding that reading to the children shows that people other than their families care about them, and about their success. Glassburn admitted he was nervous at first, but "once we got settled and we started reading and communicating with each other, I felt great. It was an incredible and eye-opening experience for me, and I'm glad I had the opportunity to volunteer." The children, ages 5 to 12, also would read and talk about the stories they selected. Fifth-grader Emoni Fort says having guest readers is fun. "They bring interesting books," she said, adding she wrote down ideas for books she should ask for when the bookmobile visits. "Reading helps you make your mind up what you want to do in college. If you learn a lot, you can do good in college." Guest readers visit the center two days per week, for an hour each time, sharing a story with the children and discussing it. Tonia Ray, executive secretary for public affairs and advancement, shared the book Today I Feel Silly, and talked about feelings with four of the youngest girls. They also discussed the children's favorite books, and why it is important to read. "Every time you read, you learn something," Ray told the girls. She enjoys sharing her love of reading with children, to encourage them to become good readers. "Anytime I can read to children, I do," Ray said. "I liked being an example of community service for others, and if I can do it through reading, all the better." Penny Lee, vice chancellor for public affairs and advancement, appreciates the opportunity to share educational resources in partnership with an important community organization. "When the opportunity to read to children at the Carver Center was presented, the enthusiastic response of our campus family was clear," she said. "We are privileged to reach out into our community to promote the importance of reading for academic success." Mickey Jackson, Carver Center program director, hopes to build children's vocabularies, along with their enthusiasm for reading, through the program. "They're connecting to the readers and responding to them," he said. "They're asking questions and making comments about the stories. They're also learning about what you can do when you are educated."